Changchun World Sculpture Park located in the south of Changchun main street Renmin Road covering the area of 92 hectares is a theme park integrating modern sculpture arts and displaying the world sculpture art schools and a modern city sculpture park combining with the natural landscape and human landscape. 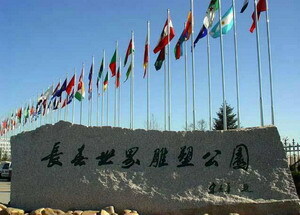 Changchun World Sculpture Park was built in 2000 and opened in September 5, 2003 with the reception of more than one million tourists home and abroad and received the praise from leaders at different levels and the tourists all around the world. The sculpture park is a large scale art theme park of modern sculpture with the characteristic of the natural and human landscape in harmony and with the subject of friendship, peace and spring and with the concept of East and West cultural and Art fusion. The Sculpture Art Museum is the main building in the Changchun World Sculpture Park. It has construction area of 12,500 ㎡ for collection and display of the rare African Makonde woodcarving and more than 1000 classic works of both domestic and foreign sculptors. The appearance of the museum is so unique that itself is also a fine piece of sculpture. There is a characteristic display zone, especially for the display of fantastic collection of art with different styles from five continents. The art museum has showroom, classroom, international meeting room and sculpture creation studio. It has complete function and first-class facilities, providing a space for sculpture lovers to show ego and feel the charm of art. There are hundreds of the world’s most magical African Makonde woodcarvings and many collected and collecting great sculptures of Chinese and foreign famous sculptors, making visitors linger.